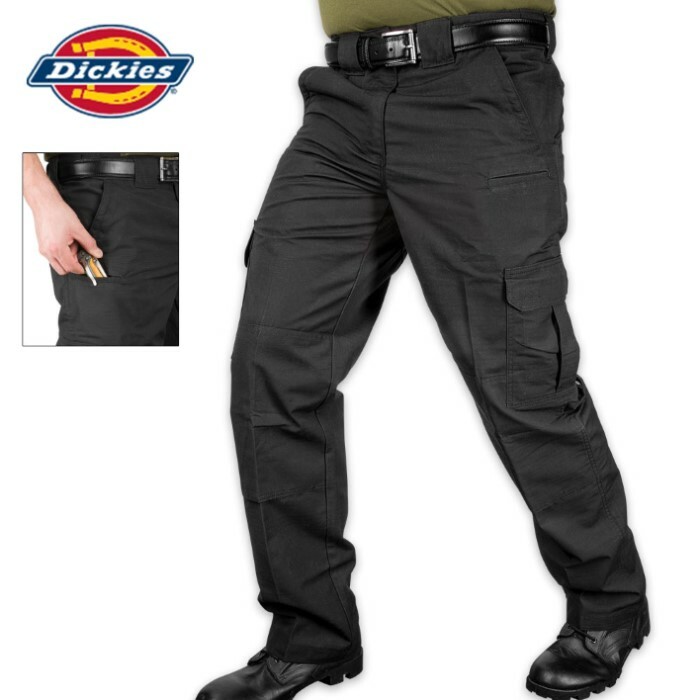 Dickies Straight Leg / Relaxed Fit Tactical Pants - Black | BUDK.com - Knives & Swords At The Lowest Prices! When your outdoor or tactical adventures include trekking through tough terrain, make sure your pants are tougher! Piercing thorns, torrential rain, knee deep mud and jagged rocks - they’re all no match for Dickies Lightweight Ripstop Tactical Pants. These black straight leg trousers are made of innovative “ripstop” fabric - a 65 percent polyester/35 percent cotton blend that stays intact in the midst of stresses that would cause other fabrics to fail. 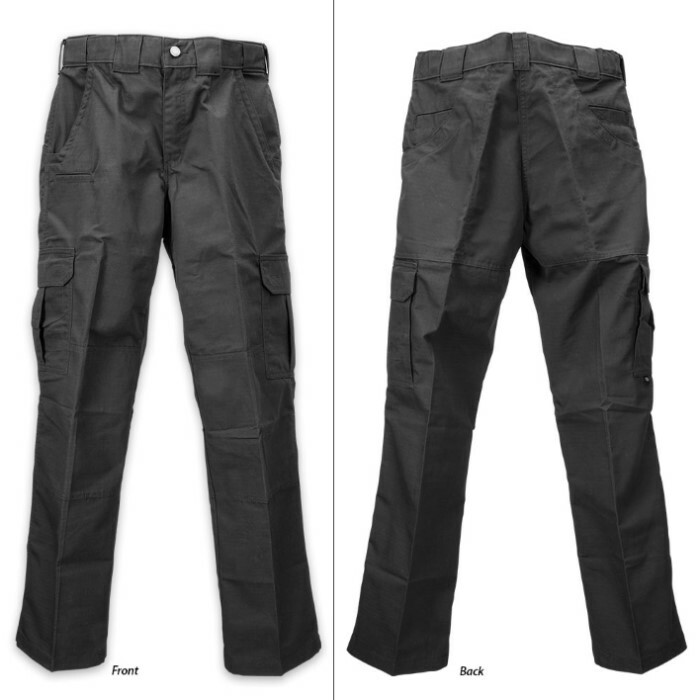 As if that weren’t enough, Dickies Tactical Pants are reinforced further at the knees and seat for added durability at sites subject to the most wear. The double knees also feature vents for knee pads. An advanced Teflon fabric protector repels water and stains, so you needn’t hesitate getting down and dirty in muddy, swampy locales. Dickies Tactical Pants also boast plenty of storage - especially important for survival, outdoor rec and tactical scenarios. 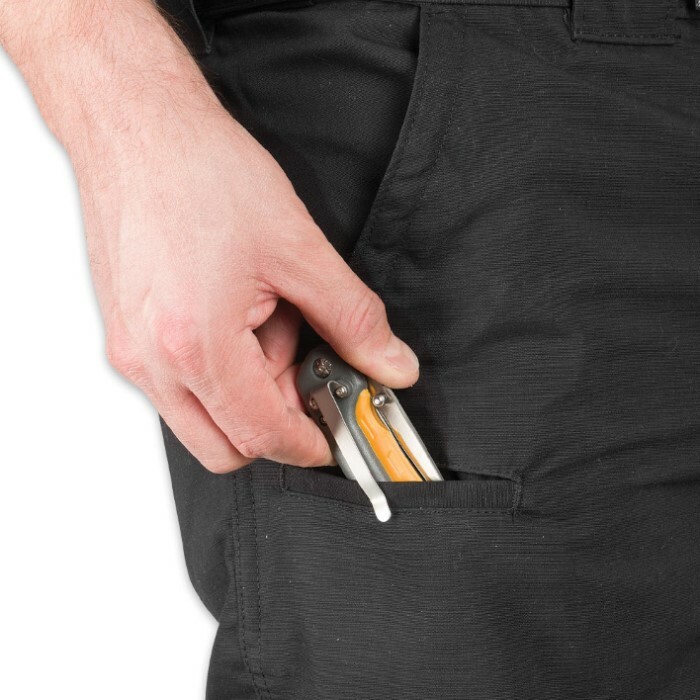 The roomy bellowed cargo pocket includes a built-in mag pouch, and front pockets are L-shaped - ideal for clipping on a pocket knife. Deep back pockets, a multi-use pocket and double reinforced inside pockets provide a host of other storage options. Dickies Tactical Pants don’t sacrifice comfort for durability and versatility. They feature a relaxed fit that includes extra room in the seat and thigh and sit just below the waist. Don’t trust any other pants! After all, they’re literally your last line of defense in challenging conditions! Available in sizes: 34X32, 34X34, 36X32, 36X34, 38X3 and 38X34.